If you want to consistently create an article or an essay that is free from grammatical errors and blunders, you might want to consider using competent grammar check software. These programs have transformed the way people write essays. But with a large number of products on the market, how do you know which program is the best software for you? In this article, we will examine three grammar check programs and see which one seems to be the best value. While the final decision will, of course, be ultimately up to you, we hope this guide will give you some insight and advice, allowing you to pick the best program for your needs. Before going any further, you should be aware that none of these programs will be one-hundred percent accurate. While they will catch a large number of blunders, there are still limitations to these automated proofreaders. So even if you have checked them using one of these three programs, it would always be better to also check them manually. One of Grammarly’s primary features is its multi-faceted ability to check sentences in terms of grammar, conciseness, spelling, clarity, and idiomatic expressions. Grammarly also provides suggestions for strengthening your writing, as well as synonyms and definitions of words. Lastly, it offers an explanation of the grammatical rules involved, allowing you the opportunity to learn from your mistakes and become a better writer. In addition to this, it features a plagiarism checker. This feature, once activated, scans the document and highlights any suspicious passages that may have come directly from other sources. This is an extremely useful tool for teachers and educators who need to check a student’s work. This application also allows you to set your goals for your article. You can, for example, choose your intent – whether you want to inform, convince, describe, or tell a story. You can select a wide variety of other parameters, as well, such as audience, style, emotion, and your domain. The more that Grammarly knows about the context of your article, the more customized its suggestions are. If you are quite unsure of the way Grammarly checked your document, the program has another option for you. You can send your work to a human proofreader. For an extra fee, human proofreaders will check your content more precisely, and have it back to you anywhere from thirty minutes to twenty-four hours, depending on the level of service you choose. When it comes to pricing, Grammarly has two levels: Grammarly and Grammarly Premium. The first is a free version, however, it only has limited functions. This version is great if you are on a tight budget. Because it can be installed as a plugin on your browser, this app can check for errors present in your emails, social media posts, and anything else you may happen to type. However, as mentioned, this version is limited. It can handle the large-scheme grammar errors and spelling mistakes, but if you want the grammar rules, vocabulary building, and plagiarism detector, you’ll need to upgrade to their Premium product. This is available in one of three ways: a monthly subscription at $29.95 a month, quarterly subscription at $19.98 a month, and an annual subscription of $11.66 a month. You can read more about Grammarly in our review. – Due to its clean user interface, it is easy to use. – It recommends ways to improve your grammar and vocabulary. – It offers plagiarism detector and human proofreader. – It provides an accurate way of checking for grammar blunders. – You need the internet to use it. – To gain the full features, you could pay as much as $359 a year. Ginger is one of the oldest grammar check programs still on the market today. Because it has been around for some time (since 2007), Ginger has gained a loyal following through the years. Its features, accuracy, and price make it a still-popular grammar software. Like Grammarly, Ginger utilizes a contextual spelling checker. Ginger, can spot words that may have been spelled correctly, but they are written in the wrong context. For example, affect and effect, lose and loose, and lie and lay, among others. Another feature of Ginger is its vocabulary enhancement capability. This feature improves your active vocabulary by suggesting alternative, more sophisticated words. Its “sentence rephraser” capability is another tool that may come in handy. It provides suggestions for writing sentences in different ways. This is helpful if you have trouble using English idioms correctly. Other ”useful characteristics that are worth mentioning include a translator, a text reader, and a trainer. The personal trainer function, in particular, keeps track of your literary mistakes. Then, it teaches you how to overcome or avoid them so you do not do them again in the future. The text reader tool reads the text back to you, something that is useful for checking the flow of the document, or the pronunciation of difficult-to-pronounce words. Finally, the translator tool is designed to accurately translate your document to over 40 languages. Like Grammarly, Ginger comes in both free and premium versions. The free version is ideal for those who write casually. However, the other features, such as the text reader, sentence rephraser, and error analysis are not available on the free version. The premium version, on the other hand, lets you experience the full beauty of Ginger. Monthly plans range from just over $12 a month, to just under $30 a month. – It features sentence rephrasing, grammar and spelling checks, and text reader functions. – It has a built-in dictionary. – It has a context-specific grammar checking capability. – It requires an internet connection. – It does not contain a plagiarism check. Finally, we have WhiteSmoke. This grammar check software, like the previous two, is compatible with both your PC and your mobile devices. A lot of users have turned to WhiteSmoke because of the convenience it offers to them. It is not only affordable, but it is also very accurate in all of its features. The WhiteSmoke grammar check function is capable of catching common errors, such as sentence fragments, typographical errors, and incorrect capitalizations, among others. It, of course, features a spellcheck function, and with its up-to-date and comprehensive database of spellings, you will rarely have to worry about missing a common, but misspelled, word. Aside from your grammar and spelling, WhiteSmoke is also capable of spotting mistakes in your writing style. This tool learns as it goes, matching your style with other samples. Then, it offers tips and recommendations to improve your writing style, while still maintaining your unique voice. You think your content is original enough? Like Grammarly, Whitesmoke offers a plagiarism checker. This is very useful for both students and teachers. Another feature that WhiteSmoke offers is its translator function. It is capable of translating any document into over 45 languages. That is definitely a plus! Some users say they find the interface to be outdated, but Whitesmoke remains one of the most popular grammar check programs on the market. . Unfortunately, only the limited, web-based version is free. The other versions run from $6.59 to $17.95 a month. – It comes with a built-in plagiarism detection feature. – It requires an internet connection in order to use it. – It may be somewhat buggy. 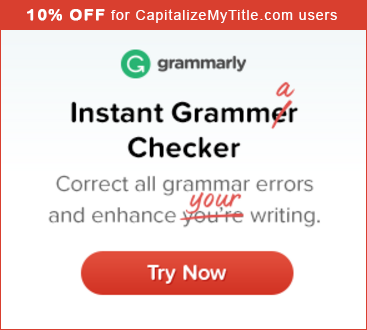 If we have to choose among the three grammar checkers, we would recommend Grammarly the most. Though the other two programs are very reliable, Grammarly’s accuracy and precision beat out the others, giving you a stellar finished product. Whether they are writing articles, books, or blog posts, many writers use and trust this program. While Ginger and WhiteSmoke are excellent alternatives that offer similar features, in the end, Grammarly offers the best value for your dollar.